As I predicted, in a somewhat tongue in cheek manner, last night, the Dallas Stars have recalled Jamie Oleksiak after Stephane Robidas suffered a broken leg in last night's game against Chicago. It may be a little too early to tell, but with Robidas's injury timeline stretching at least four months, Jamie Oleksiak may have played his last regular season game for the Texas Stars. The Texas Stars, proud American Hockey League affiliate of the Dallas Stars, announced today that Dallas has placed defenseman Stephane Robidas on injured reserve, and will be out 4-6 months, after suffering a leg fracture during Saturday night's contest against the Chicago Blackhawks. 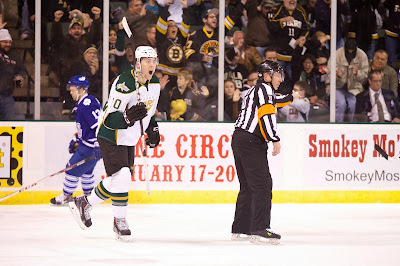 Dallas has also recalled defenseman Jamie Oleksiak from Texas. Robidas, 36, has registered five points this season (4-1=5) with 12 penalty minutes and a plus-7 rating in 24 games. The 5-foot-11, 190-pound defenseman from Sherbrooke, Quebec ranks fourth all-time among Dallas Stars defensemen in games played (704), assists (165), points (211) and is fifth in goals (46). Robidas was Montreal's seventh-round selection (164th overall) in the 1995 NHL Draft and was signed by Dallas as a free agent on Aug. 6, 2005. Oleksiak, 20, leads all Texas defensemen with three goals, posting five points (3-2=5) and a plus-4 rating in 22 games this season. The 6-foot-7, 250-pound defenseman made his NHL debut with Dallas last season on Feb. 1 against the Phoenix Coyotes and has played 16 games in the NHL, earning two assists and 14 penalty minutes. The Toronto, Ontario native was Dallas' first-round selection (14th overall) in the 2011 NHL Draft. Texas played this same club last night and knows what to expect. They score in bunches. They get good goaltending. They are a team that is a worthy competitor for the defending Western Conference champs. They are, after all, the defending Calder Cup champions themselves. I think York gets the start and that the lineup probably doesn't change up otherwise. After coming out of the first period tied at two, Texas found itself down 5-2 with just a few minutes left in the third period. The Stars managed to find the net twice in the final three minutes, but it wasn't enough as Texas fell 5-4 in Grand Rapids tonight in front of 8,288. Texas opened the scoring with a fourth line tally by Taylor Peters off a nice reversal by Francis Wathier behind the net. Grand Rapids collected the next two goals, however. Mitch Callahan scored the first shorthanded goal against the Stars on the season, scoring as the trailer off the initial shot by Cory Emmerton. Grand Rapids went ahead on Riley Sheahan's fourth of the year, a tip play in front of Cristopher Nilstorp. Texas tied things up with Chris Mueller scoring on the power play off the assist of McKenzie and Morin, a backdoor shot. Grand Rapids got the only goal in the second period as Cris Nilstorp got beat on a wrap-around goal by David McIntyre, the former Houston Aeros center. The Griffins pushed their advantage in the third period as Pulkinnen and Tootoo scored in the frame. Tootoo's goal with under four minutes left seemed to put the game on ice at 5-2 but ended up being the game-winner after a crazy final three. Texas pulled Nilstorp for the extra man with a Griffin already in the box for hooking. The 6-on-4 advantage yielded results as Scott Glennie found twine off a heads-up pass from Curtis McKenzie. Colton Sceviour picked up the second assist. Less than a minute later, the Stars' Justin Dowling got his second of the year on a searing slap shot. Cameron Gaunce continued his solid play with the primary assist. Ultimately it would not be enough as the defending champs would tighten up for the final 90 seconds to hold onto a 5-4 lead. Texas plays the Griffins again tomorrow night. After playing in ten games so far this season with Texas, Austin Smith has been sent down to Idaho. This is a paired transaction with the Taylor Vause recall. It gives Smith a chance to get solid ice time and Vause a reward for solid play in the ECHL. The Texas Stars, proud American Hockey League affiliate of the Dallas Stars, announced today that Dallas has reassigned right wing Austin Smith from Texas to the Idaho Steelheads, the team's ECHL affiliate. Smith, 25, has appeared in 10 games so far this season with Texas, recording zero points, four penalty minutes and a -1 plus-minus rating. 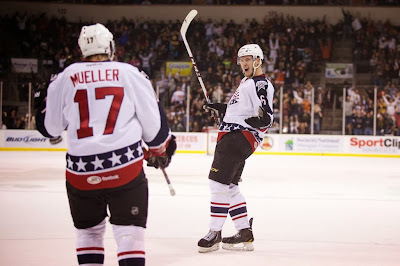 The Dallas, Texas native is in his second full pro season and has played in 38 career AHL games, compiling six points (2 goals, 4 assists) and 18 penalty minutes, all with the Stars. 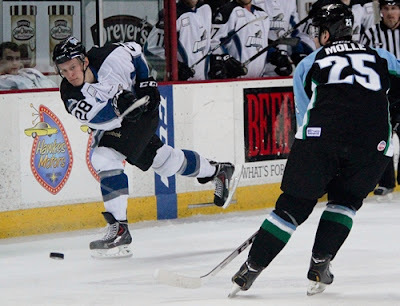 Smith skated in 38 regular season games for Idaho last season, leading the Steelheads in goals (27) and points (50). He also recorded 12 points (7 goals, 5 assists) in 17 Kelly Cup playoff games, helping Idaho reach the 2013 Western Conference Finals. Smith was drafted by Dallas in the fifth round (128th overall) of the 2007 NHL Entry Draft and signed a two-year entry-level contract on March 21, 2012. While their fans were busy eating turkey and watching football in the comfort of their own homes, the Texas Stars made a Thanksgiving plane flight to Grand Rapids for a two-game set starting tonight. Not to fear, the Americans among the team, including Travis Morin, celebrated with their families last weekend. 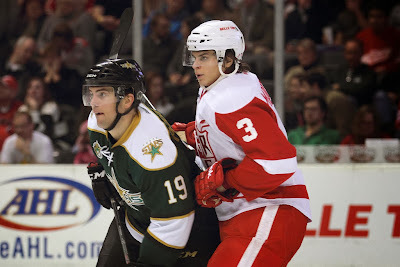 The Stars have yet to face the Griffins this year. Grand Rapids is the defending Calder Cup champion, a goal that Texas seemingly had in its sights as the playoffs started last year. Coach Desjardins said after Oklahoma City that playing the defending champion is something that they are "looking forward to". He continued, "They're a really good team and have a really strong lineup right now. They have a few guys down from Detroit. We are going to have to push and play our best through all facets of our game. They like coming against us too, I think, with Jim Nill here. They want to come after ours team. We played them in Traverse City and they were ready, more ready than we were. We have to be ready." Coach Desjardins is definitely correct about that Detroit talent. While the Stars are lucky to not face Gustav Nyquist (7-14-21 in 15 GP) this evening, they will see Tomas Jurco (10-12-22 in 19 GP). Jurco was a second round pik in 2011 for the Red Wings and put up point per game numbers in the QMJHL. After a fair season last year with the Griffins (14-14-28 in 74 GP), he is leading the club in goals and points and Nyquist is the only player even close. The next player after those two is Finnish RW Teemu Pulkkinen at 7-6-13. Also in the lineup are longtime NHLers Jordin Tootoo and Patrick Eaves. Tootoo is known mostly as a pugilist from his time with Nashville and Detroit. He only has two penalty minutes in five games played with Grand Rapids. He last played in the AHL in 2006 with Milwaukee, earning 133 PIMs in just 41 games. Eaves also last played in the AHL in 2006, a short 18 game stint with the Binghamton Senators that saw him score 5-8-13. The Griffins lead the Midwest Division by a comfortable five point margin. Most impressive in their stat line is their road record of 9-2-1-1. The schedule masters have sent GRG out on the road 13 times this season so far compared to only six home contests. Tonight's game opens a seven-game Griffins' homestand reaching into mid-December that will even out that imbalance. Grand Rapids has had excellent goaltending this season with Mrazek and McCollum both sporting sub-2.50 GAAs and SV& north of .910. They have splitw work evenly. In fact, the Griffins are allowing the third fewest goals per game in the league right now (2.42), only surpasses by Norfolk and Springfield out East. That works out really well considering that they are one of only four teams scoring more goals per game than the Texas Stars. 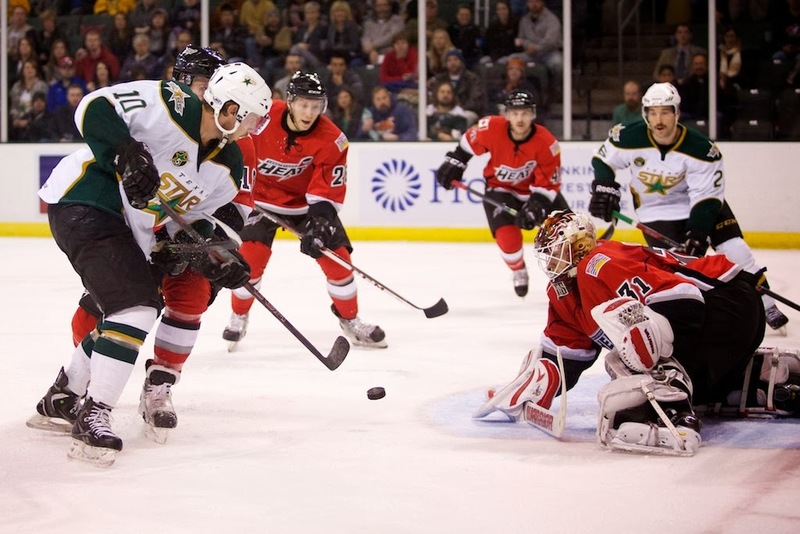 Texas is fifth at 3.48 goals and Grand Rapids is in second at 3.74. The Griffins come in on a three game winning streak, while Texas is looking to string three together themselves. Texas will have a decision tonight of waht to do with the goalie situation. It seemed like Cristopher Nilstorp had a big time bounce-back confidence-builder game on Wednesday. He still doesn't seem 100% on the injury front though, so I should think that York gets one start and Nilstorp the other. Sceviour's fifteenth of the season was the difference. 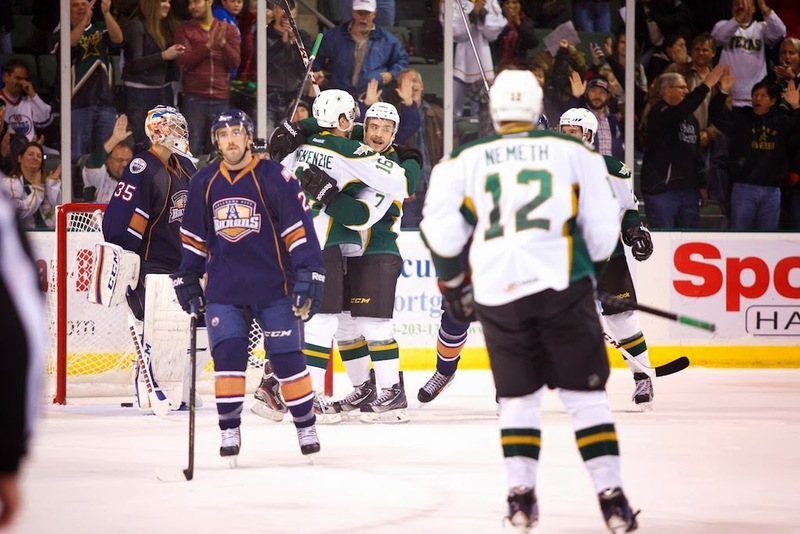 On the night before Thanksgiving, the Texas Stars carved up the Oklahoma City Barons by a 2-1 score thanks to a goal and an assist from Colton Sceviour and 24 saves by Cristopher Nilstorp. "We weren't happy with our first period, but the last two we did well," said Nilstorp, who was playing in his first game back from injury. "It was a big win for me and the team." A sleepy first period which saw the Stars get outshot by the Barons 13-11 gave way to a much more engaging second where Texas put 18 shots on net to OKC's four. "We started working harder in the second and third and got on them before they could get setup," said Coach Desjardins. Their hard work was rewarded as Colton Sceviour and Chris Mueller connected on the power play off a misplayed puck by OKC goalie Jason LaBarbera. 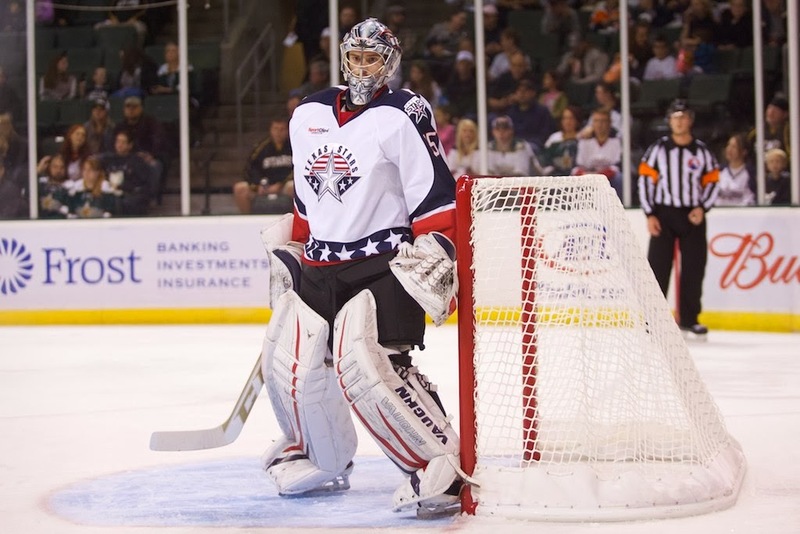 LaBarbera was making his first AHL start in six years, playing in the NHL since then. "It didn't look like [LaBarbera] was going to rim it," said Sceviour. "So I went to the middle thinking he was going to go up the gut. He bobbled it just a little bit. 9/10 that play is out of the zone. That's not something you can count on but it got us off on the right foot." Sceviour found Mueller in the slot for the game's opening goal, a power play tally and Mueller's eighth goal of the year. LaBarbera came up big through the rest of the period despite strong Texas pressure. "You notice a difference between NHL and AHL goalies," continued Sceviour, referring to LaBarbera. "They have a confidence and demeanor. They make tough saves look easy. He battled through traffic and made some tough saves that maybe a less-experienced goalie gives up a rebound." Going into the third period, Texas owned just a one goal lead despite a 29-17 shots advantage and three chances on the power play, one of which found twine. Taylor Fedun evened up the score in that third period, getting a nice feed from Linus Omark in the corner, pulling it across the crease for his third of the year. Texas didn't let it get them down. Sceviour explained, "We talked about going in to the third that they were going to get chances. Unfortunately we gave a good one to a skill player. Early in the year we blew some big leads and got down on ourselves. When that happened, everyone couldn't wait to get back out there and get that next one. We had an attitude on the bench that we were confident to get the next one." Sceviour's line would generate that 'next one' just 70 seconds later. Curtis McKenzie sent a puck hard on net from the left wing half wall that deflected off the stick of Colton Sceviour on the backside of the crease for the 2-1 score. It was his 200th career point. Maxime Fortunus had the second assist. Things got chippy as time wound down. 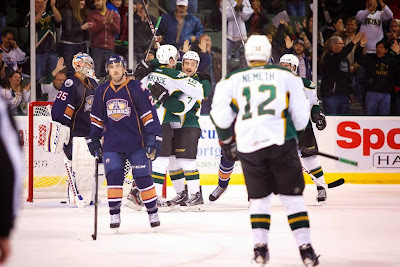 The Stars put a lot of pressure on the OKC net and got into a few shoving matches with LaBarbera and his blue liners. The Stars ended with 41 shots, a staple of their recent game. They will face Grand Rapids in back-to-back games this weekend. 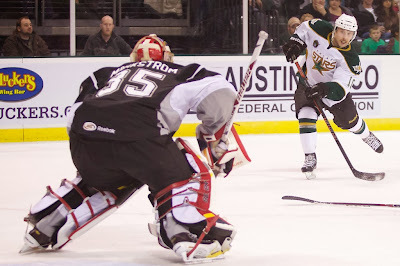 The Texas Stars (10-6-2-2, 24 pts, #4 Western Conference) picked up three points out of an available four against two non-playoff teams this past week. The Barons may be in 12th place, but by the time these two teams faceoff again (only six days away), OKC has an opportunity to pass Texas based on how things go over that time. Despite an eight spot difference in the standings, Texas is only six points ahead of the Barons. OKC even has a game in hand to go with their two head-to-head matchups against the Stars this week. They can't be dismissed. Linus Omark continues to lead the Barons offensively, putting up 10-8-18 and leading the team by six points. Omark is also second-worst on the team in plus-minus at minus-7. Only Brandon Davidson is worse at minus-10. It looks like a dangerous prospect for both teams to have Omark on the ice. The big story last time the Barons blew through town was the return of Richard Bachman and Philip Larsen to the Cedar Park Center. Both are now in Edmonton. Bachman earned a callup and outplayed previous backup Jason LaBarbera to make the roster in Edmonton on a more long term basis. That means that LaBarbera is down in OKC, where he has yet to make a start. 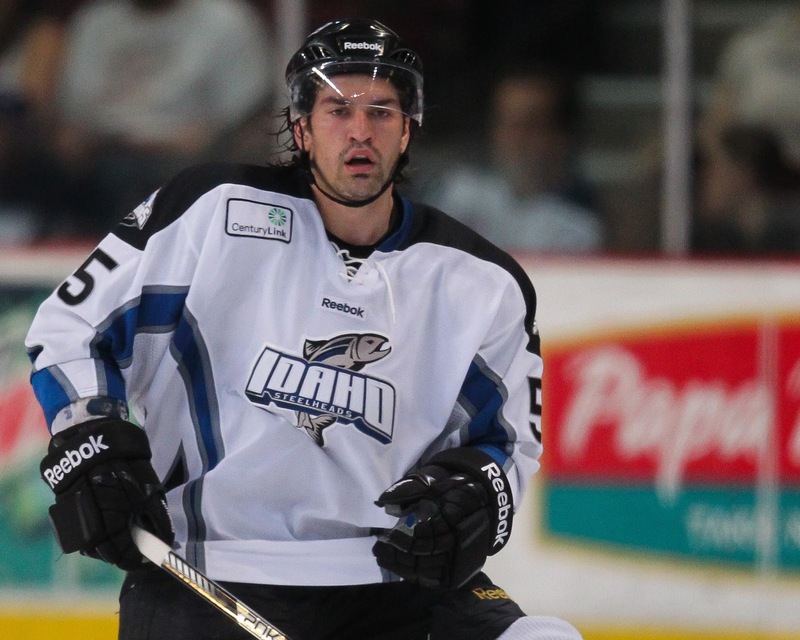 The former King and Coyote hasn't played in the AHL since 2007 with Manchester. He won both the Holmes (lowest GAA) and Bastien (goalie MVP) awards that season for his play with the Monarchs. Laurent Brossoit, formerly of Abbotsford, made both starts this past weekend with LaBarbera backing up. If LaBarbera plays, he will be the sixth goaltender to play for the Barons so far this season just twenty games into the year. On the Texas goaltending side, Cristopher Nilstorp is healthy, and I would expect him to start. Normally you would have to be excited about having your NHL contracted tender return to the net. However, Nilstorp has struggled mightily this season. He is 3-7-1 with a 3.18 GAA and .892 SV%. 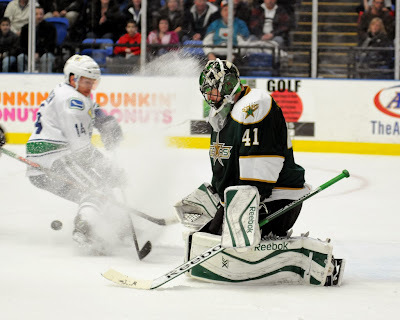 Allen York, the PTO goaltender Texas picked up on the Milwaukee road trip, is 3-0-2 with a 1.96 GAA and .932 SV%. 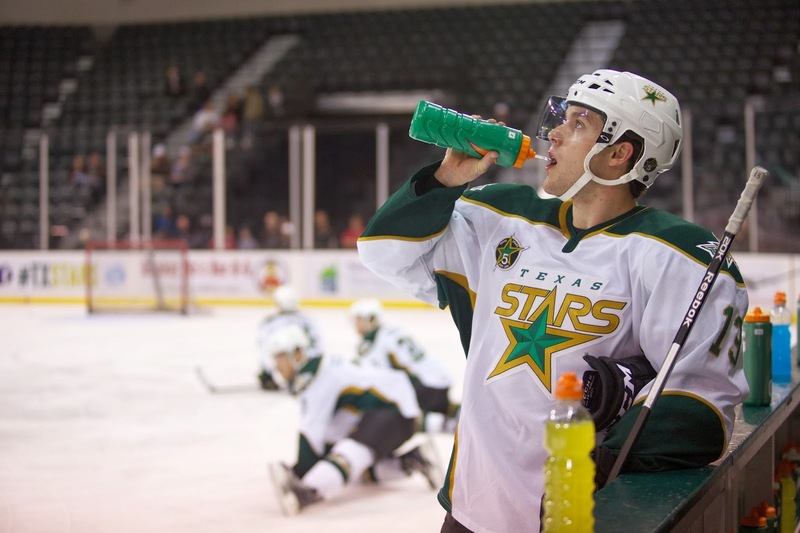 He's yet to come away from a contest without points for the Texas Stars. Convention dictates you have to play Nilstorp tonight if he's healthy because, well, he's the Dalls guy and he needs to be ready. But how long of a leash do you give him? Is this a struggle with nagging injuries that is keeping him down or is it something else? Those of us who watched him last season and are now observing again this season can see a change in his overall demeanor and body language. It's subtle, but the way he carries himself after a goal against or the body language between whistles is different. What do you do about that? Maybe you start York and then give Nilstorp just one of the games in Grand Rapids. Maybe you don't. It's certainly something the team has to be balancing. 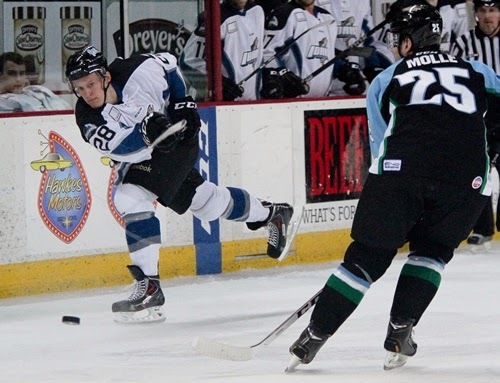 The Idaho Steelheads started a five games in seven day stretch last week, which includes games in four different cities. So far after four of these games (played over five days), the Steelheads will return home on Tuesday for a game against the Las Vegas Wranglers (Independent). Over the first four games, the Steelheads have gone 2-1-1 with the only regulation loss coming this past Saturday against the Stockton Thunder (Bridgeport) by a score of 3-1. By the end of this article, I’m hoping to convince you that this is a good thing regardless of the result on Tuesday night. Last Wednesday, the Utah Grizzlies (Norfolk) came into Idaho for the first time this regular season and played 'Grizzlies hockey'. They tied everything up defensively, were looking for the counter punch and took a couple of silly penalties. In the first period, Utah's Norm Ezekiel attempted to deliver a hit to Steelhead Mitch Wahl. Wahl would win the battle, and Ezekiel, not liking the result, decided to start throwing punches at Wahl. That earned him two minutes for roughing and two unsportsmanlike conduct. If you have been paying attention, how do the Steelheads return favors of gift power plays at home this year? By burying one in the back of the net. It was none other than Tommy Grant from Mitch Wahl and Anthony Nigro that gave the Steelheads a 1-0 lead. Utah would tie it in the second period and the teams headed into the third tied at one. In the third, the Grizzlies would get called for too many men on the ice. At first, I thought it was a bit questionable of a call as a Utah player was knocked down heading to the bench. After thinking about it, the officials got the call right. It is the responsibility of the player coming onto the ice to make sure the player coming off of the ice gets to the bench. You can’t jump a guy on when someone is hurt in a corner, you can’t put a guy on when they get knocked down about five yards from the bench door. This wasn’t the “stupid” penalty in this sequence. The teams were already skating 4- on 4 at the time and the Steelheads were prepared for a 4-3 power play. Grizzlies head coach Tim Branham then decided to continue talking to Referee Chris Pitoscia after he was told on no uncertain terms the conversation was over. That got him a two minute bench minor which then stacked three Grizzlies penalties. It amounted to a lot of power play time for the Steelheads, and Ryan Button would get his third goal of the year and the game winner for a Steelheads 2-1 win. Josh Robinson looked strong in net making 25 saves on 26 shots. 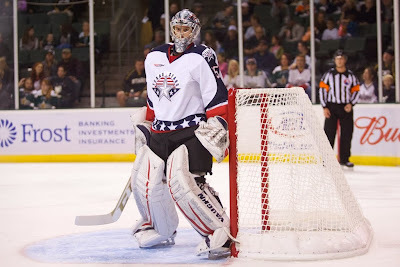 Before Friday’s game in San Francisco to take on the Bulls (Worcester) Josh Robinson was called back up to the Texas Stars forcing Brad Ralph to go with Pat Nagle in net and sign an Emergency Back-up. It would not matter as the Steelheads would take care of business with a 6-0 win. It was close through periods as the Steelheads lead 2-0, but a Justin Mercier shorthanded goal and a Brock Montgomery power play goal put the game out of reach. Nagle made 41 saves in earning the shutout. Probably feeling the effects of 3 games in 4 nights in 3 cities and a lot of bus rides, the Steelheads offense disappeared on Saturday as Ryan Constant got two goals for the Stockton Thunder. That was enough to defeat the Steelheads 3-1. Mitch Wahl had the only Steelheads goal (even strength), and Pat Nagle was 32 of 34 on the night. Sunday was a different story. After Robinson got called-up, the team made due without a contracted backup goaltender for one night but decided to sign a goaltender before Saturday night’s contest. Brooks Ostergard would get the start on Sunday and played well enough to give the Steelheads a chance. The Steelheads would lose this game in overtime 4-3 after the Steelheads got two goals in 31 seconds (Tommy Grant, Tyler Gron) to take a 3-2 lead 6:52 into the third period and tried to hang on for the win. Again, I think this was a case of just too much hockey: three games in three nights. There was enough there after a rest and lack of travel after Saturday’s game, but not enough to finish it out, especially having to play an extra 5 minutes. Having said that, Stockton didn’t score until there were just 16 seconds left in the extra frame. After Wednesday night’s game, Carl Sneep informed the Steelheads he would be leaving (presumably to retire) and in a corresponding decision the Steelheads suspended him. The suspension is to protect his rights and is the correct business move in case he decides to come back. At the time Sneep was -9 through 13 games, but had started to play a little better as of late. His veteran presence and defensive knowledge will be missed in the locker-room. 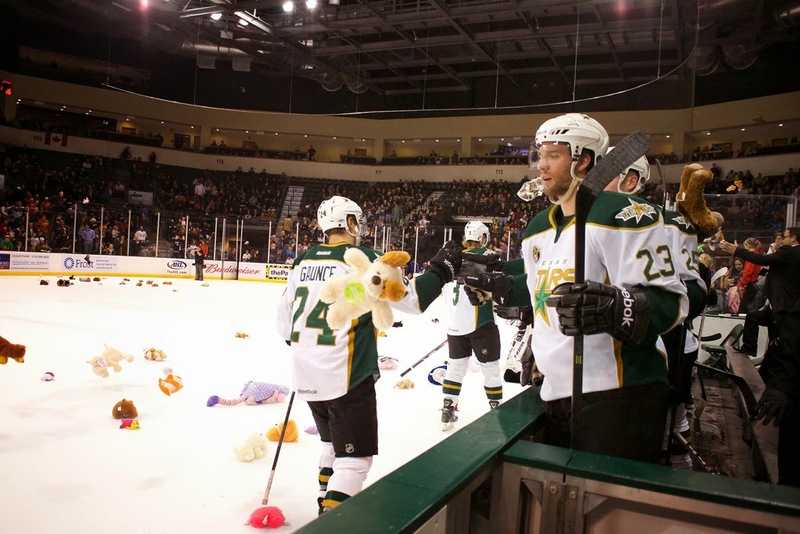 The loss of Sneep would have been ok if the Texas Stars didn’t come calling to take away Ryan Button. In 13 games Button has 11 points and was rated a plus 1. He has certainly earned his call-up and wish him all the best, but it doing this, the Stars left the Steelheads with only 5 defenseman. The Steelheads tried David de Kastrozza on the blue line the past couple of games, but ultimately head Coach Brad Ralph decided that the team needed something more permanent and decided to move forward Tyler Gron to San Francisco for defenseman Damon Kipp. Gron had 3g 1A in 13 games for the team this year. Kipp brings some solid numbers to Idaho. He currently has 4 points (all assists) and has a minus 4 rating on a team that has allowed 54 goals this season. While one fan favorite was heading out of town the team also received some good news from within the organization as the Texas Stars reassigned goaltender Josh Robinson and Hubert Labrie to the Steelheads. Goaltender Christopher Nilstorp and defenseman Maxime Fortunus have returned to the Stars roster prompting the moves. Only two games this week as the Las Vegas Wranglers are in Tuesday and Friday. The yo-yo continues for goalie Josh Robinson as Cristopher Nilstorp is back among the healthy ranks, sending Robinson to Idaho. After a 'tweak' last week, Cristopher Nilstorp is back as a full participant in practice and will tandem with Allen York for the time being. Jack Campbell is still out but has been skating over the past week, as previously reported here. 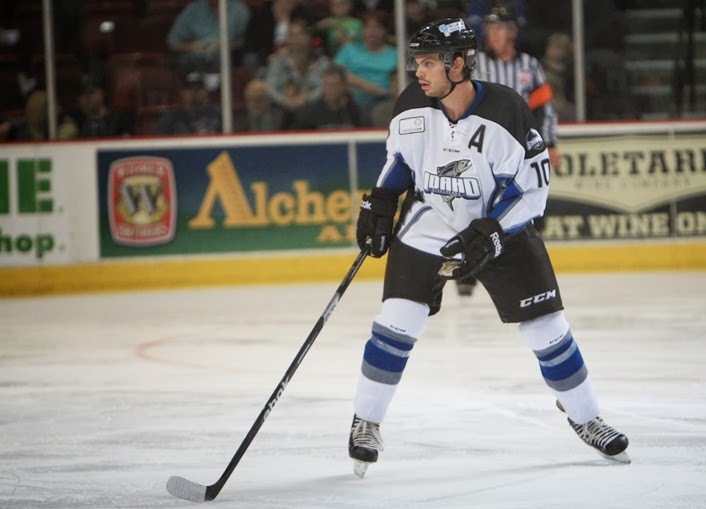 Hubert Labrie also heads down to Idaho with Robinson as Maxime Fortunus is closer to 100%. Fortunus noted that he held himself out of the game against Hamilton last Tuesday because he wasn't fully ready but then played in both games this past weekend. Labrie getting sent down is a good sign for Fortunus's health. D Patrik Nemeth, who has also been injured for a time this season, is skating in practice but has no timetable for a return. The Texas Stars, proud American Hockey League affiliate of the Dallas Stars, announced today that goaltender Josh Robinson and defenseman Hubert Labrie have been sent to the Idaho Steelheads of the ECHL. 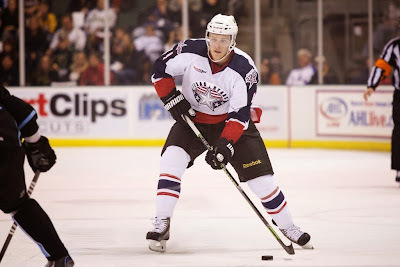 Robinson was returned on loan by Texas, while Labrie was reassigned by Dallas to Idaho. Robinson, 23, has appeared in four games for Texas this season, including a 26-save shutout in his AHL debut on October 19th vs. San Antonio. The Frankenmuth, Michigan native has a 2-1-0 record for the Stars, with a 2.49 goals-against average (GAA) and a 0.893 save percentage (SV%). In five total ECHL games this year with Idaho, Robinson is 4-1-0, with a 2.17 GAA and a 0.928 SV%. Labrie, 22, is in his third pro season after being signed by Dallas as an undrafted free agent to a three-year entry-level contract on September 18, 2009. The Victoriaville, Quebec native has played in 97 career pro games, including 64 AHL games for the Stars, with seven points (2 goals, 7 assists) and 68 penalty minutes. Labrie has one assist and five penalty minutes in four AHL games for Texas this year, while also playing in three ECHL games for the Steelheads. After starting with a 2-0 lead, Texas needed a late goal from Brendan Ranford to tie things up at three but ultimately fell in the shootout 4-3. "We came into this game after a rough road trip," said captain Maxime Fortunus. "We started strong and they found a way to get back in. It doesn't change for us. We need to keep the same game plan." Just 68 seconds into the game, Maxime Fortunus potted his second of the season from the points. With traffic in front, Fortunus walked the blue line and beat Markstrom on Texas's first shot of the night. "It was just a shot on net," said Fortunus. "I got the puck at the blue line and walked it and found a hole there. We've been working on getting in goalie's faces and making it harder to see." Scott Glennie and Brett Ritchie assisted on the play. Texas continued to pour on the shots in the frame with a 13-10 margin after twenty. The second period continued to look good for Texas as a Stars penalty kill generated more chances for Texas than San Antonio. One of those was a Travis Morin breakaway that generated a power play off a tripping call. "We have some guys that are dangerous when they're killing," said Desjardins, referring to Sceviour, Morin and Mueller, who all had chances. While Texas didn't score on the PP, there was a lot of movement. Colton Sceviour put away his 14th of the year just three seconds after the penalty expired. Morin and Mueller completed the frenetic tic-tac-toe play that saw Texas complete a few passes of just a few feet each to get Markstrom out of position for the goal. San Antonio got one back before the end of the period as pugilist Eric Selleck pounced on a loose puck in the slot and found a corner on Allen York. In the third period, San Antonio continued with two more unanswered tallies. Garrett Wilson deflected a shot by Jonathan Racine, which bounced off York's left shoulder and into the waiting net for the tie score. In the period's seventh minute, Steve Pinizzotto scored off a tip play in front, sending the puck over the right shoulder of York after the Rampage forward was left all alone in front. Trailing 3-2, the Stars were getting outshot 9-3 in the period. Texas started flinging rubber at Jacob Markstrom. After the Rampage goal, Texas outshot them 10-0 over the last twelve minutes of the period. "It's simple. 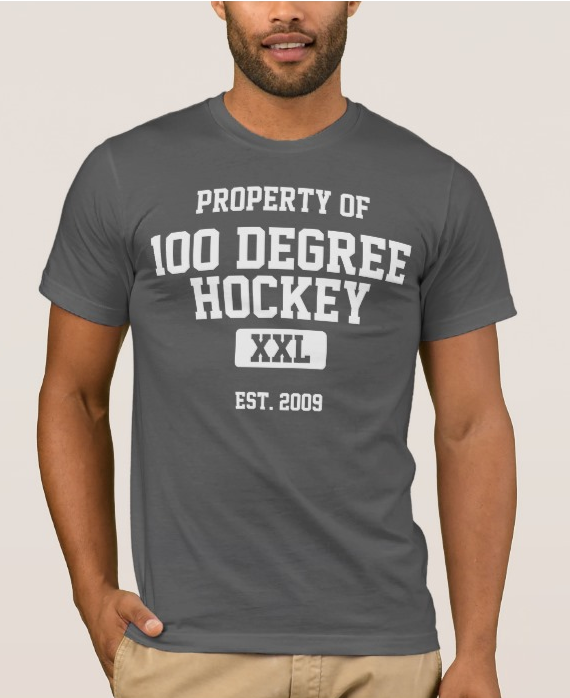 Get pucks to the net. We've seen this goalie can give rebounds," said Fortunus. Coach Desjardins added, "Once that goal went in, it seemed like we got going again. The players knew what we wanted. They weren't happy. It was them that generated it." They were rewarded as Mike Hedden won an individual puck battle down low in the Rampage zone. He managed to find Brendan Ranford in the slot, where the rookie dusted it off and picked a corner on Markstrom for the 3-3 tie. "Dowling made a great play on the wall to keep it in," said Ranford. "Mike Hedden stripped the guy and made a good pass across. I caught the puck on my backhand and tried to make a quick play toward the net. I got lucky and it went in." Texas would take the game to overtime and need a shootout to resolve the contest for the second time in a week. The Stars opted to shoot first in the contest. Usually the home club chooses to shoot second. Chris Mueller knicked the post in the first round and Brendan Ranford missed the net on an open shot in rounds one and two. Sceviour put in his try with a forehand to backhand move that he's used many times before. Texas looked poised to win when Drew Shore beat York five-hole to extend the game to a sixth round. Allen York was down and out on the sixth round but Greg Rallo jammed his shot into his left pad. Jed Ortmeyer put the game away in the seventh round with a wrister high for the win. 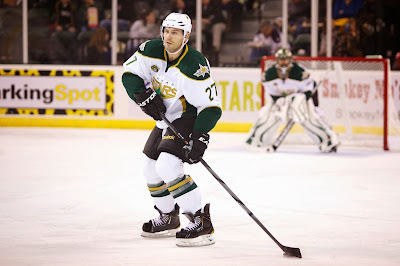 In a bit of surprising news, former Texas Star and current Idaho Steelhead Carl Sneep has left the team with the intention of retiring from professional hockey. The Steelheads announced yesterday that Sneep had left the team. In a following business transaction, Sneep was suspended by the Steelheads for the purpose of retaining his ECHL rights. "It sounds like his plan right now is to retire," said Steelheads media relations director Will Hoenike. Sneep was traded into the Stars' organization form the Penguins' org in exchange for a conditional draft pick. For a second round pick, he was spending far too much time in the ECHL and likely needed a change of scenery at the time. He played in 25 games last year for Texas before being assigned to Peoria after the trade deadline brought a glut of defensemen to Texas. He was not extended a qualifying offer after the season. Over the summer, he signed an ECHL contract with Idaho. He was in training camp with the Iowa Wild but did not make it to the opening roster. He is minus-9 in 13 games with Idaho this season, certainly not a sparkling effort, especially after his time with the Wheeling Nailers saw him at 3-12-15 and plus-22 after 29 games. With the loss of Sneep, Button and Robinson, the Steelheads will have a very interesting coming weekend as they face an all-road game 3-in-3 starting tonight in San Francisco. UPDATE: Josh Robinson recalled from Idaho Steelheads. Cristopher Nilstorp is out tonight, having 'tweaked' something in practice yesterday. 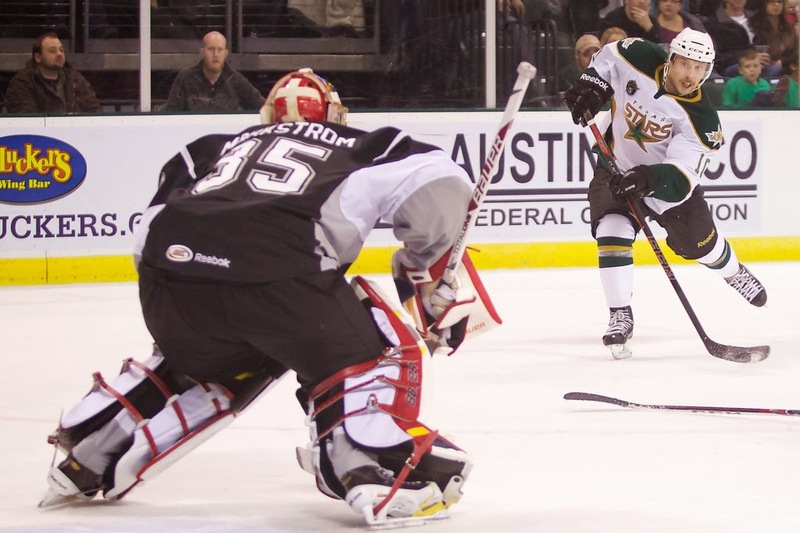 For two teams that are playing each other a total of twelve times this season, it has been an uncharacteristically long time since the Texas Stars and San Antonio Rampage faced off. Their only two games on the season so far were back-to-back in mid-October. Both contests were won by Texas by a combined score of 9-1. As many in San Antonio lament, those two games were pretty typical of the overall series between these two teams over the past five years. San Antonio writer Nathan Mallett refers to the Cedar Park Center as a house of horrors for the Rampage. It's an apt description. San Antonio is 5-11-7-1 at CPC over the past five years. That's 19-3-0-2 for Texas. The Stars have failed to get at least a point just five times in five years at home against the Rampage. All that being said, San Antonio has some momentum coming into tonight's game. They are 6-3-0-1 coming in and most recently had a blowout win against the Barons in their yearly kids' game with a 6-1 score. Vincent Trocheck continues to be a bright spot for the Rampage; he's got nine goals and nine assists on the season. He is the top rookie and the top scorer overall on the team. Former Star and now Rampage captain Greg Rallo isn't far behind with 4-8-12. For San Antonio, goaltending seems to be a carousel this year. Dov Grumet-Morris has been the one constant among the rotation of Scott Clemmensen, Jacob Markstrom and Michael Houser. DGM has had decent individual numbers, better than last year in fact (2.69 GAA, .913 SV%). However, he's 1-5-1 on the season. Michael Houser has actually had better numbers this season than DGM (2.17 GAA, .917 SV%, 4-1-0). However, the rookie Houser is in Cincinnati. Markstrom is the other netminder in San Antonio and has the best numbers, 2.02 GAA and .938 SV%. He will get the start tonight. You may notice that most of the goalies in San Antonio are in the 2.x GAA range. So what's happening? They should be winning more games. The issue is that they are averaging just .06 more goals per game than they are allowing. Also, some of those goals are coming in the 'wrong' contests. For example, those six goals from Tuesday's game against OKC could have been more useful against Abbotsford, Milwaukee or Rockford in the past two weeks, all close games. Texas should see Ryan Button enter the lineup. Allen York and Josh Robinson will likely each get a start this weekend. Kevin Connauton has been recalled from his conditioning assignment with the Texas Stars as the farm club returns from its three game Northeast road trip. Connauton played heavy minutes in his time here, which is what the Dallas Stars needed from him in order to keep him in game shape. Elsewhere, Lane MacDermid was placed on waivers this morning. 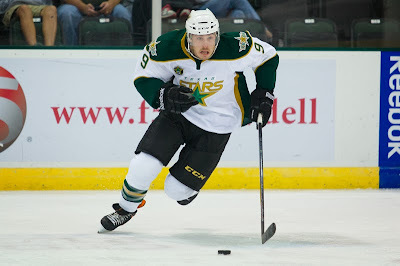 If he clears tomorrow, the thought would be that he is assigned to the Texas Stars. The pickup of Dustin Jeffrey from Pittsburgh off the waiver wire put MacDermid further outside the playing roster. He could be on the ice on Friday against San Antonio. The Texas Stars, proud American Hockey League affiliate of the Dallas Stars, announced today that Dallas has recalled defenseman Kevin Connauton from his conditioning assignment with Texas. Connauton, 23, appeared in six games with Texas, registering one assist, 20 shots on goal and 23 penalty minutes. The Edmonton, Alta. native made his NHL debut on Oct. 24 vs. Calgary, recording a +2 plus/minus rating and two penalty minutes in his only appearance with Dallas this season. The six-foot-two, 200-pound defenseman was acquired by Dallas, along with a second-round selection in the 2013 NHL Draft, from Vancouver in exchange for Derek Roy on April 2, 2013. The Steelheads finished up a six game home stand this week against the Ontario Reign (Manchester, St John’s) before they headed out to San Francisco to take on the Bulls (Worchester) on Friday and Saturday. Between wins and overtime losses, Idaho finds itself on a four game point streak to end the week. The first game of the week was the last of an extended three game series from two weeks prior where the Reign and Steelheads split shootout wins. In this game, the Steelheads were coming off a great game against the Alaska Aces (Abbotsford) the previous Saturday and had things rolling right along with the addition of Mitch Wahl back from Utica of the AHL and combinations of Tommy Grant and Anthony Nigro along with David de Kastrozza and Justin Mercier finally starting to click. The Steelheads got out to a 3-0 lead after a fast-paced first period. In the second period however, the tempo would grind and with that style of play favoring the Reign along with some Steelhead breakdowns defensively, the Reign got the score back to even as the teams headed into the 3rd period. Ryan Button would connect on a power play goal before Mitch Wahl would add an even strength goal to give the Steelheads a 5-3 lead, but before all was said and done, the Reign would tie the game back up with ten second left in the 3rd and then win the game at the 1:38 mark of overtime to steal two points out of the game. When you go back and look at this game, you start to see the Reign imposing their will to get to the front of the net. It didn’t take much to do that either, as there was not a lot of resistance by any Steelheads to deter Ontario from setting up screens and getting to scoring areas around the top of the crease. The game winner would be scored as Zach O’Brien weaved his way through a couple of Steelheads for an easy goal as he beat Pat Nagle for the win. The offense showed up ready to play, but the defense thought it could take a night off. In the end, it cost the Steelheads a point. In Friday’s game in San Francisco, the Steelheads got back off to their customary slow starts as Josh Robinson returned to net for the team. In the first, the Bulls got a quick 1-0 just over a minute into play and that score would hold until Justin Mercier scored a goal in the period’s final minute to tie the game at 1 after the first. In the second, Mitch Wahl would continue his assault on the power play with his first of the night to give the Steelheads the lead, but the Bulls would answer back with 2 straight, one at the end of the second and one in the beginning of the third to take a 3-2 lead. In an odd quirk, the shoe was on the opposite foot from Wednesday’s game where the Steelheads needing a goal late would get one as once again Wahl would convert another power play opportunity to tie the game up at 3. After no scoring in the overtime period, the Steelheads would get the bonus point winning the shootout 4-3 for a 4-3 game victory. Robinson was back in the net for Saturday’s game and again the Steelheads allowed a goal in the first 5 minutes to go down 1-0. This score would hold up until just past the halfway point of the game before once again Mercier would tie the game at 1 and just over a minute later William Rapuzzi would get his second of the year to give the Steelheads a lead they would not relinquished. After Carl Sneep got his first goal later in the period, the Steelheads would take the win and get out of town with four points. Anthony Nigro (12GP, 7-7-14) tied for 9th overall in the league scoring. Ryan Button (12GP, 2-8-10) tied for 1st overall in defensemen league scoring. William Rapuzzi (12GP, 2-11-13) tied for 2nd overall in rookie scoring. Josh Robinson (4GP, 2.45 GAA) ranks at 14th best goals against average in the league. The Steelheads start a rough stretch of games as they get set to play six games in nine days to finish out the month of November. It starts on Wednesday at home against the Utah Grizzlies (Norfolk). The team then travels back to San Francisco for a game Friday, Nov. 22nd. After that a trip down to play the Stockton Thunder (Bridgeport) for two games on Saturday the 23rd and Sunday the 24th. Then it’s back to Idaho for a pair of games against the Las Vegas Wranglers (Independent). With a tough stretch coming up, we’ll have to wait and see how things shake out. In these next six games, I would expect Idaho to get at least eight points. 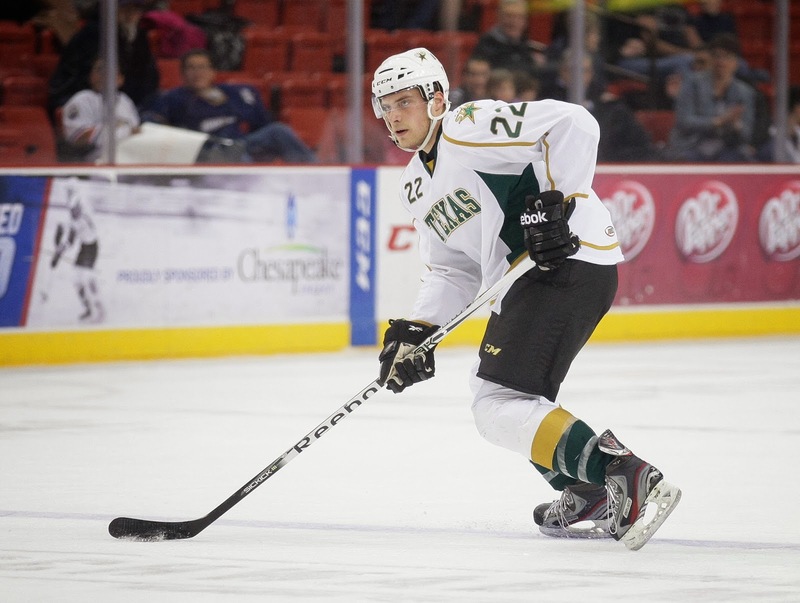 The Dallas Stars announced a pair of roster moves this morning, sending Aaron Rome to Texas and picking up long-time Wilkes-Barre/Scranton Penguin Dustin Jeffrey off waivers. Rome, if he can make it to Toronto in time, will certainly figure into the lineup. With Morin gone in Dallas, Rome will not introduce a veteran rule issue. The move gives Texas seven healthy defensemen. Two more, Nemeth and Fortunus, remain on the injured list. he Texas Stars, proud American Hockey League affiliate of the Dallas Stars, announced today that Dallas has claimed forward Dustin Jeffrey off waivers and has reassigned defenseman Aaron Rome to Texas. Jeffrey, 25, has skated in 10 games for the Pittsburgh Penguins this season, earning one assist and nine shots. The Sarnia, Ont., native has played six seasons in the Penguins’ system, including 100 career NHL games where he has earned 28 points (15-13=28). The 6-foot-1, 205-pound forward was Pittsburgh’s sixth-round selection (171st overall) in the 2007 NHL Draft. Rome, 30, was recalled from Texas on Nov. 8 and did not appear in any NHL contests. The Nesbitt, Man., native has skated in eight games for Texas this season, registering one assist and a plus-1 rating. The 6-foot-1, 220-pound defenseman was Los Angeles’ fourth-round selection (104th overall) in the 2002 NHL Draft and was signed by Dallas as a free agent on July 1, 2012. Dallas is in action today against the Vancouver Canucks at 7:00 p.m. CT at Rogers Arena. It's too bad that the Texas Stars and Toronto Marlies only get one matchup in each city each season. If nothing else, it would bring a lot of ex-pat fans to the Cedar Park Center to see the future of the Maple Leafs. I digress. Today's game is in Toronto and features a Marlies team in the unfamiliar position of a non-playoff team as things sit today. Toronto is in 10th place today after two straight years of sitting near the top of the standings at years end. Surely roster turnover is a part of that; it always is. However, one of the biggest losses for the organization will not show up on the scoresheet explicitly. Dallas Eakins, former head coach of the Marlies, is now the bench boss in Edmonton. He was highly sought after due to his success in the American League and Edmonton poached him to put some fire and work ethic into their young crew of talented players. The Marlies are now headed by Steve Spott, former coach of the OHL's Kitchener Rangers (Radek Faksa's junior club). Spott has been graced by some exceptional individual efforts this season. T.J. Brennan and Travis Morin were neck and neck in the early season for the scoring race. That is made more impressive knowing that Brennan is a defenseman. He is 10-9-19. Spencer Abbott has caught up to him and is now 1-18-19. Others to note include vet John-Michael Liles (2-5-7) and rookie Sam Carrick (1-3-4, plus-6). With that many points, why are the Marlies out of the playoffs? Is it goaltending? Drew McIntyre is their main man, playing in 11 games this season and sporting a 7-4 record with a 2.27 GAA. Rookie Garrett Sparks is 0-2 with a 4.10 GAA. McIntyre's numbers are not horrible; it's just been bad luck. The Marlies have allowed a lot of goals in games where they score a lot and then not been able to score in games where their goalies perform well. That's a bad numbers game. 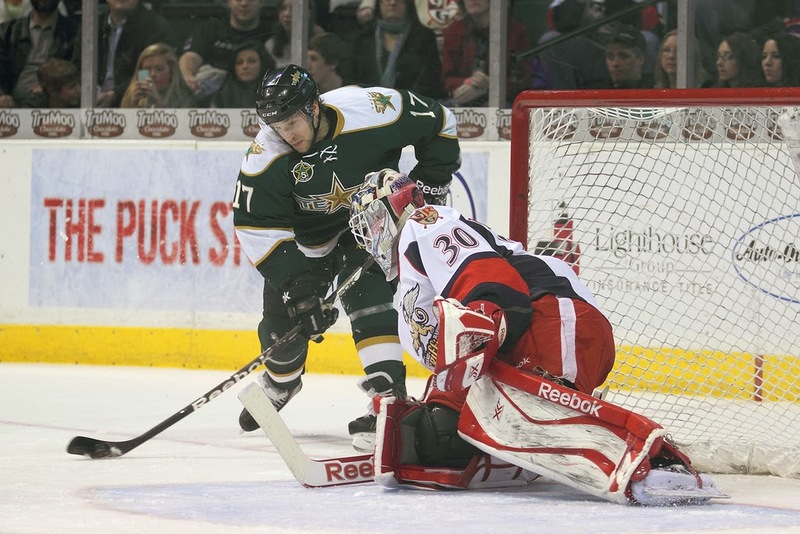 In their only game in Toronto this regular season, the Texas Stars hope to eat up Toronto and continue to crack down on some of the bad penalties they have been taking over the past week. Last night's two penalty performance was a step in the right direction. 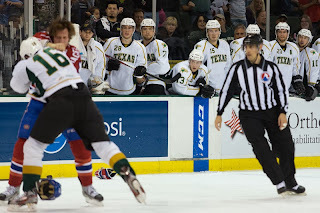 Given the vastly different league standigns of the two clubs, a 2-1 victory is a thin margin for the Texas Stars, but they will take that win to start their three game road swing in the North Division. 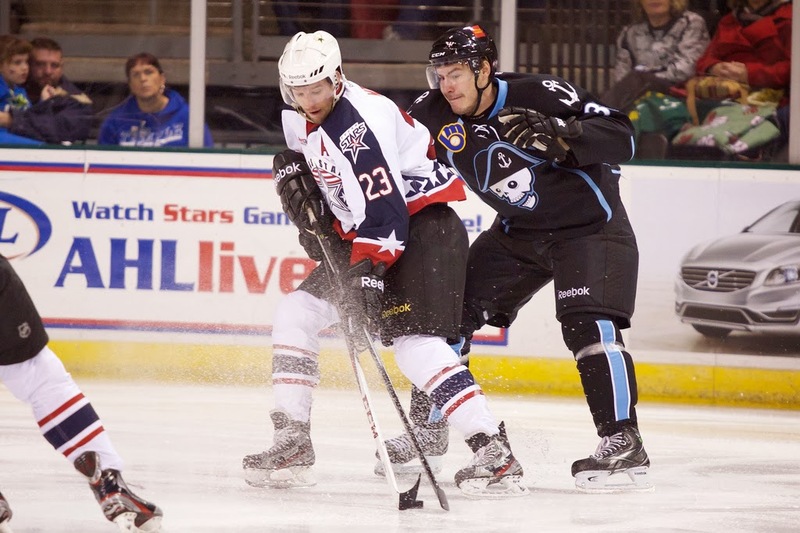 Mike Hedden headlined the night with a goal and an assist, earning first star honors. Cristopher Nilstorp bounced back with a 28 save performance. Texas never trailed in the game, leading by 1-0 and 2-1 marks. The Stars converted on their only power play of the night and stopped two Utica man-advantages. The Comets outshot the Stars over three periods. This was the only game Texas will play in Utica this season barring playoffs. Hedden started his night with a redirect of a William Wrenn point shot halfway through the first period. Labrie had the second assist on the goal on the D-to-D pass. Hedden's goal extended his quietly growing point streak to eight games. Utica evened things up just before the end of the period with Alexandre Grenier's 4th of the season. The rookie skater from the left wing circle tied the score at one after twenty minutes. Frank Corrado assisted. A scramble play on the man-advnatage early in the second led to the ultimate game-winner. Matej Stransky's 3rd of the year, a tap in play on a loose puck, was assisted by Justin Dowling and Mike Hedden. 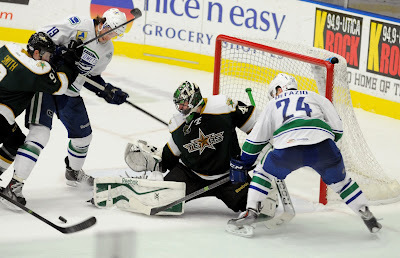 Nilstorp shook off his previous bad games in the third period and stopped all eleven Comets' shots while Texas only mustered five of their own on Joacim Eriksson. Texas is in Toronto tomorrow to face the Marlies. What to do with the goalie situation was an open question after Wednesday's game. With Nilstorp healthy and two other fit tenders on the roster, Texas had to decide whether to assign Josh Robinson to Idaho or release Allen York from PTO. GM Scott White opted to assign Robinson and keep York as the team heads to Utica for their only game at the Comets this season. Texas plays back to back on Saturday and Sunday this weekend so York and Nilstorp will probably each get a start. No word if Campbell also traveled with the team. Texas also has not announced any moves yet regarding defense, hinting at the possible return of Maxime Fortunus after a one-game absence. Without Fortunus and Nemeth, Texas would be down to six defenseman and common wisdom would dictate that they would look to call up a defenseman from Idaho, likely Ryan Button. 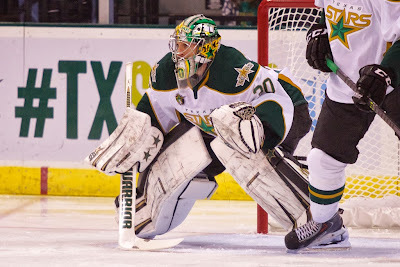 The Texas Stars, proud American Hockey League affiliate of the Dallas Stars, announced today that goaltender Josh Robinson has been returned on loan to the Idaho Steelheads of the ECHL. Robinson, 23, has appeared in four games for Texas this season, recorded a 26-save shutout in his AHL debut on October 19th vs. San Antonio. The Frankenmuth, Michigan native has a 2-1-0 record for the Stars, with a 2.49 goals-against average and a 0.893 save percentage. Robinson has also started two ECHL games for Idaho this year and is 1-1-0, with a 3.00 GAA and a 0.914 save percentage.